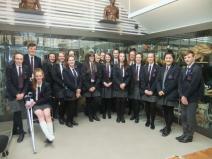 Congratulations to Amy Watt (10X) who is the first student to achieve 100 merits this year. A fantastic achievement and an inspiration to others. Merits are available to students who arrive to school on time, complete all homework and demonstrate the ability to follow the Code of Conduct outlined in the Positive Behaviour Policy. 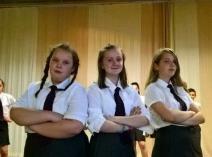 As a school, we are committed to identifying and rewarding students who excel in the merits they achieve. As always we will be encouraging students to strive to achieve their next certificate reward, whether that be 50 or 100. Students should use this incentive to ensure they are working to their full potential within school, building on the good foundations they have already in place. It is so important for students to ensure they keep themselves organised and manage their time appropriately to gain as many merits as possible. 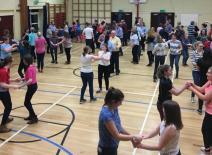 80 aspiring jivers were in attendance for the opening night of our School Association Jiving Lessons on Tuesday evening. Jiving instructor Raymond Quinn and his team (Up The Jive Jiving Lessons) were on hand to give advice and support on the night. 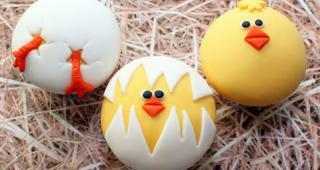 Jiving continues next Tuesday (27th) from 8.00-9.30pm with the final session (week 5) on Tuesday 20th March. £5 per person per night – everyone welcome. Following the publication of the annual GCSE League Tables by the Irish News (dated 19/02/18), Newtownhamilton High School has once again impressed with a 9th place finish out of 133 non-selective schools for pupils gaining 5 GCSE grades at A*-C including the all-important GCSE English and GCSE Maths. 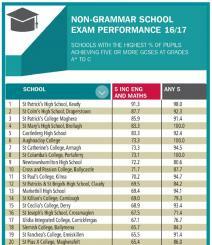 The table also confirms a 3rd place finish within the controlled schools sector behind Castlederg High and Aughnacloy College. 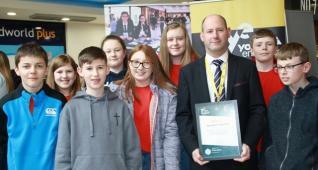 Reflecting on this latest success, Newtownhamilton High Principal Neil Megaw stated "Consistency is the key word when it comes to describing our GCSE results over the last 10 years. However, while previous GCSE results and this latest set of statistics are very pleasing, the number 1 priority is that our pupils are happy, because a happy child will learn and subsequently experience success. I congratulate the class of 2017, their parents and our dedicated teaching and non-teaching staff for this fantastic achievement". 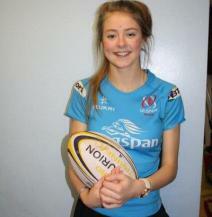 Congratulations to our Year 12 pupil Jenna Corkey who was selected for the Ulster Ladies U18 squad for an upcoming 7s competition. Jenna plays for local club Armagh and has been training with various Ulster squads for the past few seasons. We all wish Jenna the best for her competition! Many thanks to everyone that supported our recent Can’t Cook, Won’t Cook event which was hosted by local catering expert Joy Rollston. Contestants Willie Hughes, Ian Frazer, Chris Coils and Matthew Jenkins proved that they were up to the task on the evening and also provided much light hearted entertainment. Special mention must be reserved for our School Association Members and also to our Home Economics teacher Mrs Carol Alexander. 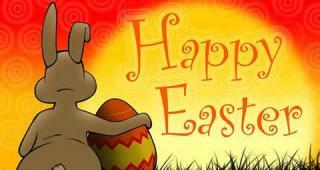 Thanks also to those individuals and businesses that donated raffle prizes. The evening ended with a fabulous supper with the audience getting to taste the dishes produced by our now culinary experts. The staff and pupils of Newtownhamilton High School were delighted to welcome Armagh, Banbridge and Craigavon Council Lord Mayor Gareth Wilson to their Monday morning assembly. The Lord Mayor spoke to the pupils about identity and in particular the Christian identity before presenting badges to the newly elected Student Council. Principal Mr Megaw then gave the Lord Mayor a tour of the premises which included a visit to classrooms thus providing an insight into day to day life at Newtownhamilton High School. Monday morning assembly saw Newtownhamilton High School welcome the Armagh City, Banbridge and Craigavon Council Lord Mayor. Mr Gareth Wilson spoke to pupils about the importance of identity and how we are identified by the actions we take in our daily lives. 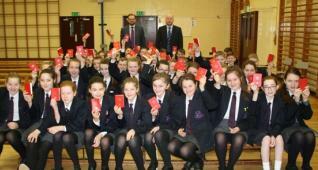 He encouraged pupils to be respectful towards others, befriend those who struggle to make friends and to look out for and help those in need. 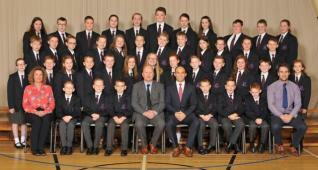 The Lord Mayor also agreed to present the newly elected Student Council with their school badge. 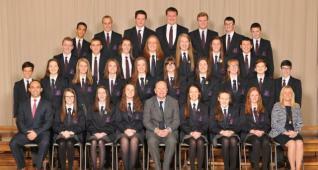 We look forward to the Student Council working hard for the benefit of all pupils within the school. 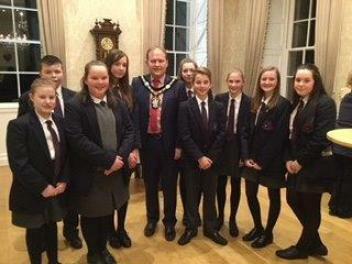 Some of our Year 9 pupils recently attended the launch of the CAPG (County Armagh Phoenix Group) Intergenerational Drama and Genealogy Project Booklet at the Lord Mayor's Parlour in Armagh. 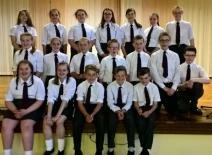 This event brought the curtain down on a very successful adventure into the past for our pupils which was delivered by CPAG Project Tutor Frank McHugh. During a series of workshops in May 2017, Frank combined genealogy and drama together while obtaining family memories, stories and photographs that were used to create family trees and the celebratory booklet. 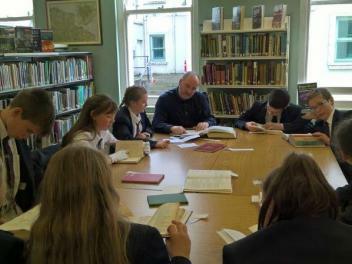 Copies of the booklet are available on request from the school office. Many thanks to CAPG, FACT (Fermanagh and Armagh Together) and Frank McHugh for all the support provided while a special mention is reserved for Lord Mayor Gareth Wilson for his kind invitation - the buffet certainly went down well with our pupils! Congratulations to our Year 10 hockey team following an impressive 4-0 away victory at Newry High. The goals were scored by Andrea Whyte (2), Dinah Park and Nicole Bailie. 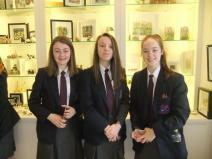 Year 9 pupils had a very successful day at Rushmere shopping centre. The year group formed four QuickStart companies in September and following planning, research, analysis and marketing the companies got to test their entrepreneurial skills through selling their products on their individual stalls. 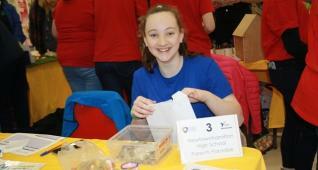 Each company was judged throughout the day and pupils were especially excited when Arlene Foster visited their stalls. 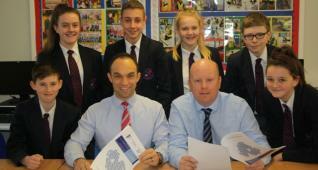 Congratulations to all four companies who have worked very hard planning their business. During the awards ceremony there was great excitement when Young Bolts were announced as runner up. 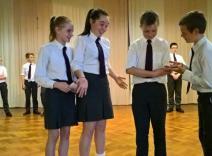 Our school was ecstatic when the winner was announced – Grand Designz! A very special congratulations to both companies. 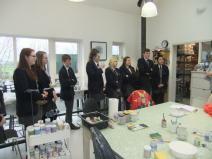 02/02/18 - GCSE Art trip to True Colours Exhibition, Belfast. 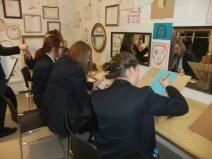 A great day was had at the Ulster Museum so our pupils could view the top GCSE and A Level exhibition. There was a wide range of work on display which will give the pupils a lot of ideas and also inspiration for their own projects. A stop was then made at McDonalds for lunch before moving on to Mount Ida Pottery with ceramicist Trevor Woods. 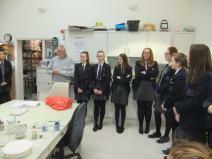 He gave a careers talk about his business and pupils got to see his amazing work. The trip concluded with a short visit to the FE Mc William Gallery, at Banbridge, to see a portrait exhibition and McWilliam’s own work. 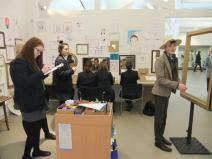 Pupils had the opportunity to do some sketching and try some poses for a portrait sitting. Miss Johnston would like to thank the pupils for such a good day and she is looking forward to seeing their work inspired by this trip.